The Chapel of the Pontifical Irish College is dedicated to All the Saints of Ireland and has been reordered by the Slovenian Jesuit Fr Marko Ivan Rupnik and the international ecumenical community of artists at the Centro Aletti, Rome. The new mosaic was installed in March 2010. 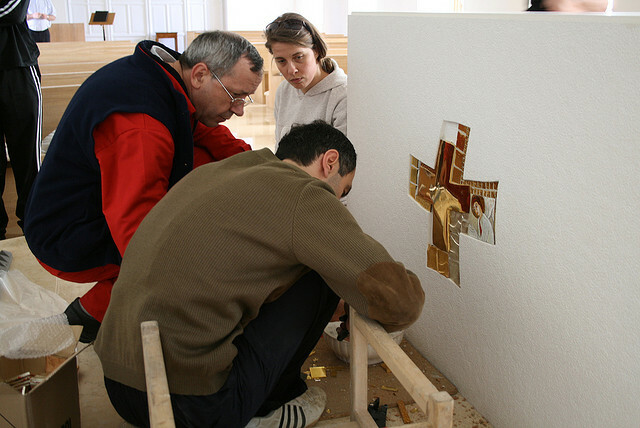 Fr Marko Ivan Rupnik SJ and artists of the Centro Aletti at work during the reordering of the College Chapel. The seminary community gathers in this Chapel at dawn for Morning Prayer (lauds) and Eucharist. Before lunch the rosary is prayed. As evening draws in, the seminarians and priests gather once more for Evening Prayer (vespers), meditation and for Exposition of the Blessed Sacrament. On Sundays, the congregation swells as pilgrims to Rome join with local families for Sunday Mass followed by catechesis for parents and children. Over the course of a year, seminarians receive the various ministries which mark the road to priesthood, children celebrate First Penance and receive First Communion and Confirmation, and almost a hundred and fifty couples celebrate their wedding in this Chapel. A church is a space that is consecrated for community worship and for private prayer. While a booklet such as this may try to describe the various details of the structure and of the decoration of the Chapel, it is only when one joins the praying community or meditates quietly within its mosaiced walls that the true purpose and meaning are revealed. Here the encounter with the living God takes place and the salvation promised to us is really ours. The ancient belief that the prayer of the Christian community gathered here on earth is one and the same as that of the communion of saints in heaven. This is the key to understanding this Chapel.